It was a beautiful evening for the five hundred guests who attended Hannibal-LaGrange University’s 76th Annual Booster Banquet. The banquet featured keynote speaker Coach Steve Spurrier and was sponsored by HNB Bank and WGEM. 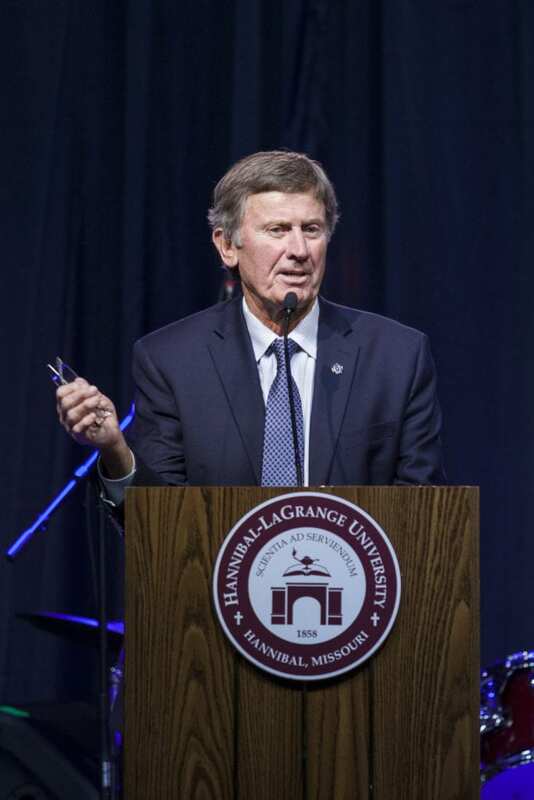 Spurrier believes that the year he coached HLGU President Dr. Anthony Allen and his teammates on the 1989 Duke University team when they won the ACC championship was the year that really kicked off his career in coaching. He credits that team’s success with teamwork, setting achievable goals, and taking the steps to complete those goals. “Big success happens when all teams work together, pull for each other, love each other,” said Spurrier. He believes that teamwork is the greatest lesson that football can teach about life. Though Spurrier is well known for his lengthy and successful career in football, he says that baseball and basketball were his first loves and that he didn’t become a good football player until his senior year of high school. He later went on to play football for the University of Florida, which is where he met Jerri, his wife of 51 years. “I think that turned out pretty well, don’t you?” said Spurrier with a smile. Spurrier served as the head coach for three college and two professional teams and was also an exceptional college football player before spending nearly a decade playing professionally in the NFL. He is the only person alive to be inducted into the National College Football Hall of Fame as a player and as a coach, to be the winningest coach in school history at two Power 5 universities, and to both win the Heisman trophy and coach a Heisman winner during a National Championship Season. He is also author of the book Head Ball Coach: My Life in Football. In addition to Coach Spurrier’s address, those in attendance at the banquet witnessed a presentation of awards to Carole Jo Riley, Bleigh Construction, and Calvary Baptist Church for their endowed scholarships for University students. Following the presentation of awards, HLGU’s ministry team, Praise Song, took the stage to perform a selection of their praise and worship pieces from the semester. The evening was closed out by Dr. Anthony Allen, HLGU President, who appealed to those in attendance to support the students at HLGU. All in all, an enjoyable evening was had by everyone in attendance. For more information about HLGU’s annual Booster Banquet, please contact Lauren Youse, director of alumni services and development at 573-629-3126, or via email at lauren.youse@hlg.edu.